established the first Catholic school in the U.S.
established the first Catholic orphanage in the U.S.
Born in 1774 in New York City, to a respected Episcopal family, Elizabeth was a child of privilege. Her father was a physician, and Elizabeth fit well into New York City society. Sadly her mother died when Elizabeth was three, but her father remarried and her new mother was a social activist and took Elizabeth with her to help distribute food to the poor. When Elizabeth was 19, she married wealthy businessman William Magee Seton. The couple had five children but William died from tuberculosis a mere nine years later while they were in Italy. While there, Elizabeth learned about the Catholic Church, and when she came back to New York, she converted to Catholicism. Many of her friends and relatives spurned her because of this conversion. In addition, William’s business went bankrupt and Elizabeth was desperately poor. To support herself and her children, she opened a school for girls in her home then a boarding house for boys but both failed because families didn’t want their children influenced by her Catholicism. A visiting priest, who had escaped France’s Reign of Terror, asked her to come to Baltimore for refuge. Elizabeth accepted and her life changed again. In 1809 she established the Sisters of Charity of St. Joseph in Emmitsburg, MD dedicated to caring for children of the poor. She then became known as Mother Seton. 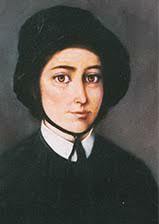 Mother Seton died of tuberculosis on Jan. 4, 1821 at age 46. Archbishop James Gibbons of Baltimore called for Catholic saint canonization in 1882, and Pope Paul V1 canonized her on Sept. 14, 1975. Jan. 4 is her feast day in the Catholic Church.